TL;DR, Use HashSet for all general purpose usage i.e. where you need to store only unique elements without any ordering requirement. If you need to maintain order in which elements are added into Set then use LinkedHashSet, it provides ordering with little impact on performance. Use TreeSet when you absolutely nee to keep elements in specifically sorted order e.g. keeping employees in increasing order of their age or salary. Remember, TreeSet is significantly slower than LinkedHashSet and HashSet because of this sorting overhead. BTW, if you are preparing for Java interviews, I suggest taking a look at Java Programming Interview Exposed by Markham. You will find a lot of such question with a very detailed answer. HashSet doesn't guarantee any order, while TreeSet sorts all object based upon there natural ordering by using compareTo() method, or custom order by using compare() method Comparator passed to them. LinkedHashSet also provides ordering support to keep elements in the order they are added into Collection. Actually, this property is also derived from the fact that they are backed by respective Map implementation. See the difference between HashSet and HashMap for few more details on these two classes. This property can be deduced form HashMap, LinkedHashMap, and TreeMap since HashSet internally uses HashMap, LinkedHashSet internally uses LinkedHashMap and TreeSet internally uses TreeMap. Both HashMap and LinkedHashMap allows one null key and so are these two Set implementations. On the other hand, since TreeMap doesn't allow null keys, TreeSet doesn't allow null elements and throws java.lang.NullPointerException when you try to add a null object. The main reason of this is the use of compareTo() and compare() method, which throws NullPointerException if one element is null, but it truly depends on implementation. Earlier TreeSet is internally implemented TreeMap but with introduction of NavigableMap in Java 1.6, its implementation has changed. Iterator retuned by all three Set implementations are fail-fast, which means if you modify collection once iteration begins i.e. add or delete elements without using Iterator's remove method, it will throw ConcurrentModificationException. Also Iterator of HashSet doesn't guarantee any order, while Iterator of LinkedHashSet let you iterate in the order elements are added. You can also see this article to learn more about different types of Iterator in Java. Out of HashSet, LinkedHashSet and TreeSet, HashSet is fastest for common operation e.g. add, search and remove, LinkedHashSet is close second, as it suffers a little drop in performance due to overhead of maintaining doubly linked list when an element is inserted or deleted. TreeSet is much slower than these two because it needs to perform sorting every time there is change in TreeSet. It means by default you should use HashSet, until and unless you really need LinkedHashSet or TreeSet. You can also check this article for more difference between TreeSet and TreeMap in Java. Here is a nice table to compare different implementation of Set interface e.g. EnumSet, TreeSet, CopyOnWriteArraySet, HashSet, LinkedHashSet and ConcurrentSkipListSet on different parameters e.g. data structure, sorting, iterator and how they handle null input. 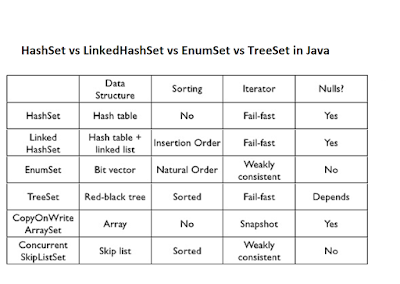 That's all about difference between LinkedHashSet vs TreeSet vs HashSet in Java. You should use HashSet for general purpose Set requirement, where you need to store only unique elements without any sorting or ordering requirement, if you need to maintain the order on which elements are added into Set, apart from guarantee of unique elements, use LinkedHashSet. If you need to keep your elements in a particular sorting order use TreeSet, you can either keep elements in their natural order or you can customize their sorting order by providing a Comparator e.g. keeping notes in increasing order of their value.